The desire and hunger to share experiences and emotions is like an unstoppable snowball, even verging on addiction. Society today contributes hugely to the explosion of this process through its obsession with image at all costs – we want everything and we want it right now, with enjoyment measured by the number of ‘likes’ received. Experiencing certain things purely to satisfy other people’s curiosity puts a limit on the possibility of discovering and appreciating unique moments, like stopping to listen to the silence, contemplating nature, and cherishing an adventure by talking about with companions, not experiencing it through a screen. Reviving this shared understanding and goals is the difficult challenge of our times. 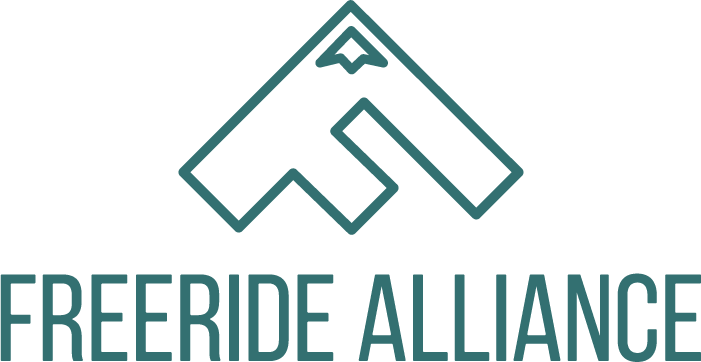 FREERIDE ALLIANCE IS NOT A MOVEMENT OR A CREW, IT IS SIMPLY A GROUP OF PROFESSIONAL AND PASSIONATE FRIENDS WHO SHARE THE SAME VISION OF THE OUTDOORS AND ADVENTURE: EVERY DAY, IN EVERY SEASON, IN ANY CONDITIONS, IN BOTH OUR WORK AND PLAY. FREERIDE ALLIANCE OPERATES IN A UNIQUE AND INCREDIBLE PLACE: THE AOSTA VALLEY, WITH ITS MOUNTAINS, ITS PEOPLE, ITS CULTURE AND ITS FOOD, NOT TO MENTION ITS WORLD OF POSSIBILITIES. Let the Aosta Valley win you over and let Freeride Alliance indulge your passion with experiences and adventures to enjoy together.